Opponents characterized the comment as insensitive given Mississippi’s history of racially motivated lynching. Hyde-Smith, who defeated Democrat Mike Espy in Tuesday’s runoff election, said her remark was “an exaggerated expression of regard.” More than a week after the video’s release, she said she apologized to “anyone that was offended” but also said the remark was used as a “weapon” against her. Hyde-Smith was seen in another video talking about making voting difficult for “liberal folks,” and a photo circulated of her wearing a replica Confederate military hat during a 2014 visit to Beauvoir, a beachside museum in Biloxi, Mississippi, that was the last home of Confederate president Jefferson Davis. Hyde-Smith’s victory made her the first woman elected to Congress from Mississippi. She was appointed to temporarily succeed Sen. Thad Cochran after he retired in April and will complete the final two years of Cochran’s term. Espy was seeking to become Mississippi’s first African-American senator since Reconstruction. 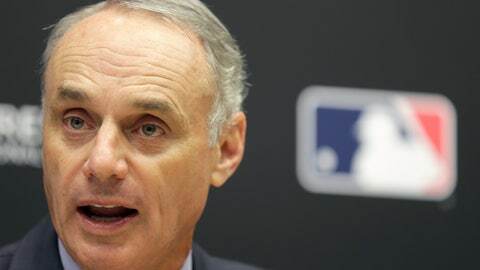 Manfred did not want to comment on Charles Johnson, one of the San Francisco Giants‘ principal owners, and his wife Ann each making a contribution to Hyde-Smith for $2,700, the individual maximum.